Some bacteria use tails, or flagella, to swim through liquids—including those in our bodies. 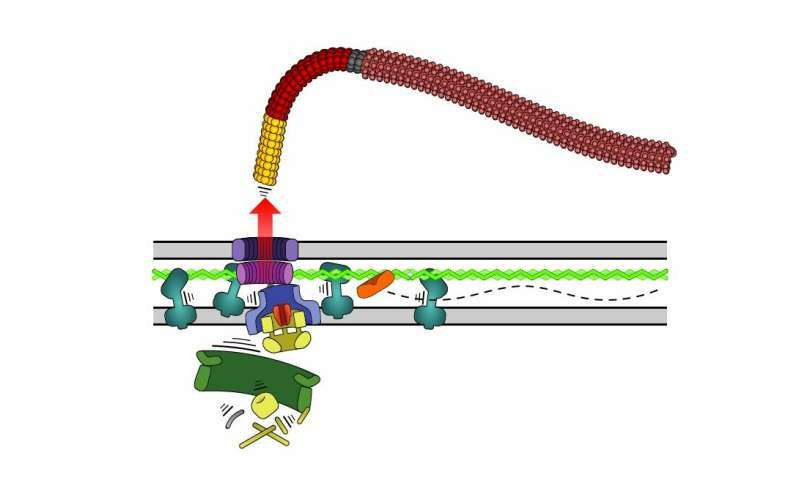 However, new research published today in PLOS Biology reveals a surprisingly drastic measure taken by some bacteria when facing starvation: they eject their flagella, leaving themselves paralyzed, but conserving energy so they can stay alive. They saw some instances where part of the motor 'housing' was present in the membrane of a bacteria, but not the motor or flagellum itself. This suggested two possibilities: either they had caught an image of the motor-flagellum complex as it was being assembled, or as it was being disassembled. First author Josie Ferreira, from the Department of Life Sciences at Imperial, said: "Before we started our experiments, we thought we had caught the bacteria in the process of assembling their motor-flagella complexes. To our surprise, we found the opposite: not only had the bacteria ejected their flagella, they had plugged the hole it left behind. This suggested to us it was a deliberate action." Bacterial use their flagella to get around, even swimming through thick gut mucus as in the case of food-poisoning bacterium Campylobacter jejuni. However, flagella are costly to build and power, and constantly grow throughout the bacteria's life, using up a lot of resources. Lead author Dr. Morgan Beeby, from the Department of Life Sciences at Imperial, said: "The bacteria's actions appear to be deliberate. It's not like when our fingers or toes drop off from frostbite—it's more a calculated act like mountaineer Aron Ralston cutting off his arm in the film 127 Hours to free himself from under a rock." Dr. Beeby also says that although the bacteria have evolved a clear mechanism for ejecting flagella and plugging the gap, the process shows how irrational and messy evolution can be. He said: "Evolution is not neat or tidy: leaving the motor structure behind in the membrane is a kind of 'bacterial clutter' that the bacteria close the door on. While an inelegant solution, their molecular clutter doesn't hurt them."